Hello and welcome to the last day of the Southwest Stockings Knit Along! We've done a lot of knitting and now it's time to embellish our big Christmas sock. If you've knit the Cozy Socks then you're probably on your way through the second sock and almost done. For the Christmas Stocking knitters today we'll add a hang loop and top it with a pom pom. Woohoo! Remember, you can always watch me work these steps on The Knit Show with Vickie Howell. In the pattern it tells us to cast on 4 stitches and work back and forth in garter stitch for 6". That's all we need to do. Now we stitch that little strip of fabric to the top edge of the stocking. Lay the top of the stocking out flat and attach the hang loop to the first 2 and last 2 stitches of the ribbing at the top of the stocking. Use the tail and the darning needle to sew it securely. Bring the other end of the loop around and stitch that down to meet the first edge. Sew, sew, sew. Remember, this is what holds that stocking up when it's all packed with presents! And, done! A cute little loop. Our next job is to weave in the yarn ends inside the stocking. I usually flip mine inside out, weave them in, then flip it back the other way. When you're all done give your stocking a good blast of steam to help set the stitches. I use my regular iron set to the highest steam setting. Hover the iron over the fabric and let the steam relax the yarn. Never touch the iron to the project! Set the iron aside and let the stitches cool before touching them. Ahh, look how even! Now for the best part, pom pom time! 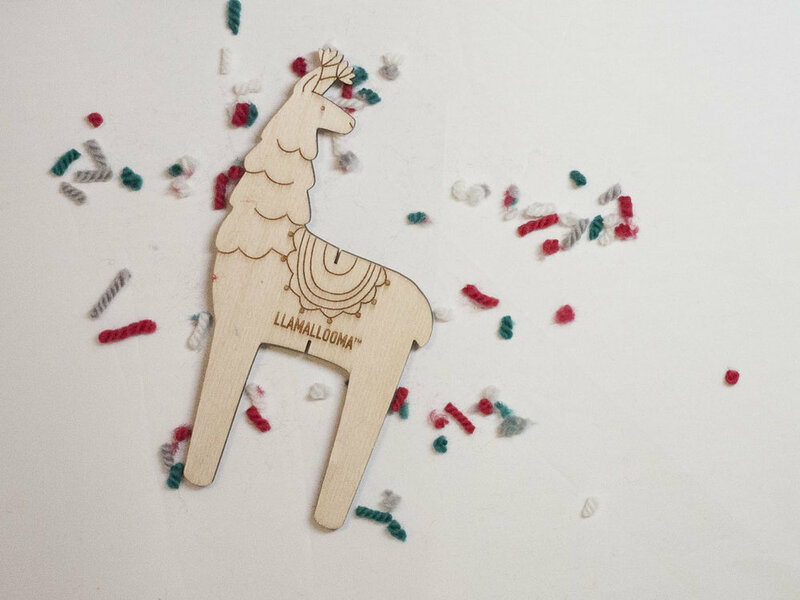 I made pom pom with the Llamallooma Pom-Pom Maker by Betz White. This little llama is so adorable that I had to use it. The first step is to wrap a long strand around the llama's body. This will be the yarn that secures the pom pom together after we cut the strands. I decided to make a pom pom using all 4 colors that are in my stocking so I lined them all up and wound them around the llama's legs until it was thick and full. Next we untie that original loop and tie it tightly across our wrapped yarn. Remove the yarn bundle and carefully cut the loops in half to make a fluffy pom pom. Trim your pom pom to make it round. There's always weird long pieces on any pom so give it a good haircut. And attach it to the top of the stocking by the hang loop. And there we have it! A finished Southwest Stockings Christmas Stocking. I can't wait for Santa to come and fill it with goodies in a few weeks! Be social! Post photos. Ask questions. Say hello! Follow @eweeweyarns on Instagram. Follow @theknitshow. Tag @eweeweyarns. Hashtag #SouthwestStockings and #theknitshow. Join the Ewe Ewe Yarns group on Ravelry and say hello! in the Southwest Stockings KAL thread. Follow Ewe Ewe Yarns on Facebook. Leave a comment or question below or you can always email me! Introducing: Southwest Stockings Knit Along! Take a few minutes to watch the show if you haven't. Here's the episode free on YouTube. We're starting this knit along and we'll work through all the steps of the free Southwest Stockings knitting pattern. You can make Cozy Socks or a big Christmas Stocking from this design. To find more info about the Southwest Stockings KAL see the Introduction and the Supplies list. Today we're getting started! We're going to cast on to double-pointed needles and try our needles at all this fun color work. Let's dive right in! An important part of this project is organizing your yarn colors and keeping it all straight while you work the color charts for the ankle and foot of the socks. I have decided to make a second Christmas stocking for the KAL and I'm using the same four colors of Baa Baa Bulky yarn for this one but I'm rearranging the colors so my husband I have a mismatched pair to hang for Santa. Because my colors don't match up to the color chart I took a minute to decide my new order and make some notes on my pattern pages. I wrote in the placement of Colors A, B, C and D and then I made little arrows to help me visualize it when I'm using the color chart on page 3. You should do this too before we get started. Keep in mind that everything I say here in these knit along posts applies to both the Christmas Stocking and the Cozy Socks. The pattern is completely the same! Let's get this party started! When beginning a project on double-pointed knitting needles, also called DPNs, I like to cast-on all my stitches to one needle. For this project we cast on 48. Now we need to move distribute these stitches evenly across 4 needles. We're going to slip 12 stitches to a fresh needle, get a new needle, slip 12, ...until we have 48 stitches broken up into four 12 stitch sections. Another little trick I like to do when knitting in the round is to criss cross the first and last stitches on the needles. This locks the beginning and end together and helps prevent the little gap you can sometimes see at the starting edge of a hat or other project knit in the round. I'll admit this step is fiddly. Feel free to skip it if this is the first time you're working with DPNs! It won't even been an issue if you're making the Christmas stocking because we'll have a hangloop and giant pom pom up there when we're all done. Next we knit! Well, knit and purl. The first 7 rows are worked as K2, P2. So go ahead, grab that 5th needle and k2, p2 your way across 12 stitches, rotate to the next needle, k2, p2 across, rotate, ...until you've gone across all 48 stitches. 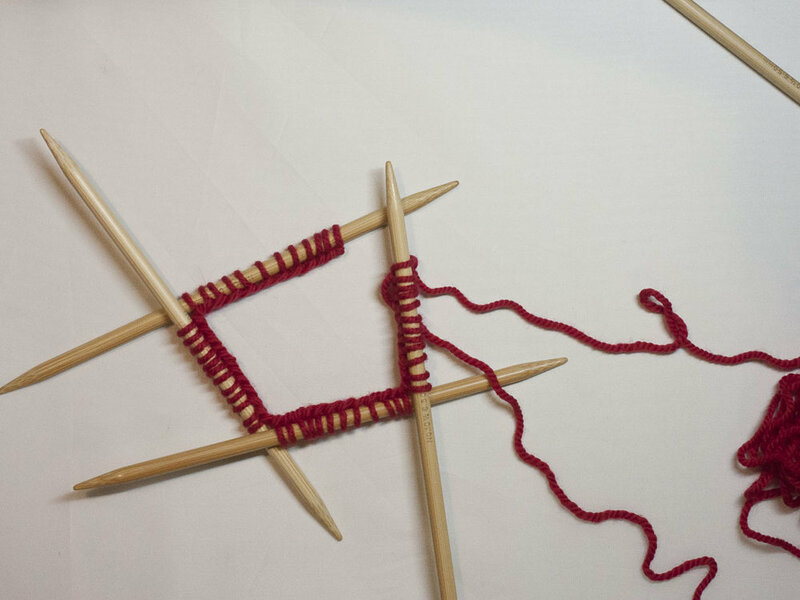 I know it may seem crazy if you haven't worked with double-points before but all you want to do is focus on 2 needles at a time just like with regular knitting. You have one in your left hand and one in your right hand and that's all you need to think about! Just work those 12 stitches. The first row is always crazy for every knitter no matter their skill level so keep going! The next little tip I have is to add a clip ring stitch marker to your project. I add it add it to a stitch near the beginning of Needle 1 so that way I always know where my round begins. And now we keep going! We have 6 more rows of k2, p2 to work. You'll have a nice little start like the one below -- 7 squishy rows of work. Here we are! Time to get down to the fun stuff, Fair Isle knitting. It's one of my favorite things to knit because every row is different so I never get bored. Each round is like a new little puzzle that I get to build to unfold a growing pattern. With any color work we will have a chart to follow. 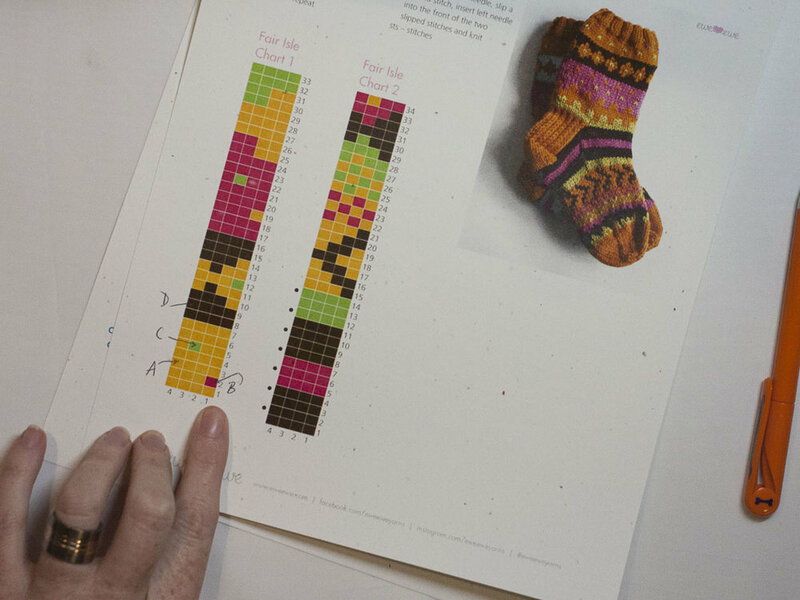 The chart for our Southwest Stockings is on page 3 of the pattern and we're starting with Fair Isle Chart 1. To work a chart we read it from right to left and bottom to top. We start right here at the corner of Round 1 and Stitch 1. All the stitches from here to the heel will be knit. Since we figured out our color placement ahead of time we know that the first row just continues using Color A so we knit one time around with A. Round 2 has a little block of Color B. Woohoo! Now what? Now we just grab our Color B. I run the tail down through the middle and the working yarn out to the top. Then we knit the first stitch with B. Grab that new yarn and knit your first stitch. Bam! You're a color work knitter! The chart reads that we knit 1 stitch in Color B and then 3 stitches in Color A. It's just that simple and we do it all the way around repeating that as we go. But! We have to keep our stitches loose and relaxed enough so that moving between colors doesn't pucker our work. Carrying the non-working color of yarn is called "floating". These floats need to be loose enough that the knitting can stretch a bit and not too tight that it could disfigure the project. Getting a comfortable float tension will get easier over time. I work with one color in my right hand and one color in my left hand. You can watch me do this live on The Knit Show with Vickie Howell. As you can see, I stretch the float yarn loosely across the back of the work before making the next stitch. On these early rows it's always a good idea to stop and check each float and maybe adjust the length of it before moving on to the next stitch. It's ok to go slow and get comfortable with this new technique. This is what the inside starts to look like, long loops behind the work. Take your time! Watch the video. Remember that I've been doing this a long time. We have all weekend to get this right before moving on to the next step! If you have a question message me on Instagram at @eweeweyarns, drop a comment in the Ravelry group, leave a comment here, or email me! I'm here, let's chat. Look at that! We're knitting with color! Next is two rows of Color A and then we sprinkle in some Color C. I'm going to cut this strand of B so it's out of my way since we don't use it again until Round 17. Leave a tail so you can weave the ends in later. Continue knitting and working the color chart as you go. And, we're off on our way! I love how festive these colors are looking together. Work all the way through Fair Isle Chart 1 over the weekend and I'll meet you back here on Tuesday the 14th to talk about how we make the heel of the sock. Handmade holidays are the best kind of holidays. I want to share my love of holiday knits with you with a knit-along! I recently appeared on The Knit Show with Vickie Howell to teach how to knit the Southwest Stockings. This pattern can make either a Christmas stocking or a pair of cozy socks and I'd love to work on them with you. I've even got a few more tricks up my sleeve that I'll show you along the way. I hope you'll join me for the Southwest Stockings KAL! A knit-along, or KAL, is a virtual sit-and-knit. We're all going to make the same project during a set timeframe and I'll show you how to do it! I hope you'll join me. 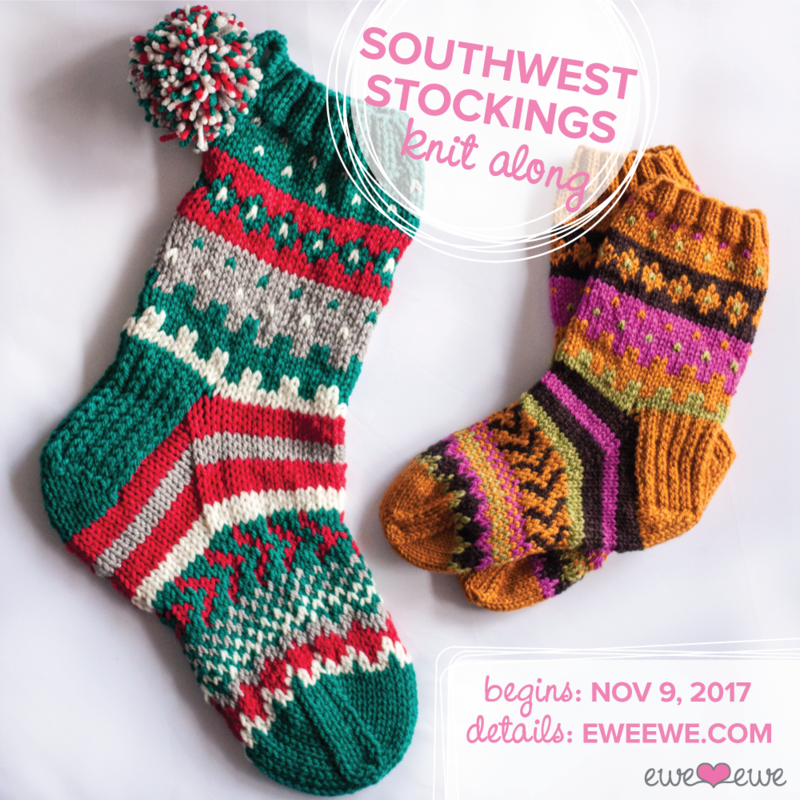 Continue reading to see more details and decide if you'd like to knit the Southwest Stockings with me. Which project would you like to knit? Pick your color way. The best part about Ewe Ewe is that all of our yarn colors are planned to work together so you really can't go wrong. Find a Ewe Ewe yarn store near you to see the colors! Perhaps you're going to make the Cozy Socks to wear on Christmas morning or give as a gift. Take a look at the Cozy Sock kit ideas or browse Wooly Worsted yarn colors. Get an email for each KAL post! That's me right there! I am on the incredible new knitting series called The Knit Show with Vickie Howell. I teach the easy way to knit Fair Isle socks with instructions on how to make socks for you or a Christmas stocking for your home! Watch the Handmade Holiday episode now. Holidays are made better when a little something handmade is involved. On The Handmade Holiday Episode of The Knit Show with Vickie Howell we show stitchers how to make their season bright with projects to give and decorate with, plus gift ideas for the crafty types in your life! On the show I teach this adorable socks and Christmas stocking combination. The Southwest Stockings knitting pattern includes instructions for both a Christmas stocking knit in Ewe Ewe Baa Baa Bulky AND cozy Fair Isle socks using Ewe Ewe Wooly Worsted washable merino yarn. Visit The Knit Show to download the free pattern! The techniques I teach in the video are how to read a color work chart for Fair Isle knitting, knitting with two colors of yarn, turning the heel of a sock, and how to graft the toe of a sock using the Kitchener Stitch. Ready to make the Southwest Stockings? We have knitting kits available! Grab the pattern from The Knit Show's website and then take a look at our kits. We put together some great color combinations so you can choose and get started right away. I hope you have as much fun knitting these socks and stockings as I did. The color work is easy and the projects go fast. Download the Southwest Stockings free knitting pattern. Shop yarn kits. The Knit Show Season 1 Teaser is here! The Knit Show with Vickie Howell is coming soon! I'm so excited to see how the episodes come together and to watch the whole series with a big bowl of popcorn. The entire season drops on October 5th so you can binge, binge, binge on ALL the knitting and crochet! Watch the Season 1 teaser video below – you'll see my name scroll by as an "amazing superstar guest!" Doesn't it look like it's going to be a great show!? Be sure to head over to YouTube and SUBSCRIBE to The Knit Show channel. That way you'll get updates about when the season launches. Woohoo! This week I got to film my segment on The Knit Show with Vickie Howell. You may remember that Vickie ran a successful Kickstarter campaign to get this new web series into production and now the time was here for all the lights, cameras, and action. It was so fun and amazing! The show is being filmed in Austin, TX so I got to take my first trip to there and it did not disappoint. I stayed in this crazy little spot called The Highlander Hotel. It's kind of a redone motel with a fresh coat of wild paint on it but the beds were clean, staff was nice, and they have these adorable hot pink sheep all over the hotel! hahaha. How could hot pink sheep not make any hotel a thousand times better? The Knit Show was filmed in this really awesome restored auto mechanic shop. It was a huge building that has been made amazing with exposed beams and reclaimed wood from old schools. As a guest on the show I got to hang out in the green room which was full of snacks, gift bags, and the show's makeup artists and all of her goodies. Hello! I got to relax for a while, have some coffee, and a breakfast burrito – an Austin staple! – then it was time to shoot my segment. I am part of Episode 10 which is all about holiday knitting and gifting. The project I designed for the show is an awesome concept that will make you go, WOW! Hint: It uses the same number of stitches but you can make something fun for you to wear or change the yarn and the needle size and make something for your home. Any ideas? Leave a comment below! The crew set up my yarns and projects in such a cute way. They have cameras set from three or four different angles including one overhead! You'll be able to follow along as I demonstrate how to make the project so you can make it yourself. Hello, tutorial! Here's the crew getting all the lights and rigging set just right. They were great. Here's a wider shot of the set. Vickie was all set and ready to film the exit clip for Episode 10. I stayed around so I could watch. It's not every day you get to be on a film set, you know? And that was it! My segment went by so fast but I think it will be great. I can't wait to show it to you! Here I am with Vickie and some of the crew. We had to stop to take a photo of the ginger brigade. Redheads for life. The Knit Show with Vickie Howell drops all in one binge-watching-extravaganza on YouTube October 5th. Go to theknitshow.com to subscribe!